Green Earth's Chautauqua Bottoms is located on the north side of Chautauqua Road, between Emerald Lane and Tower Road. Historically this area was bottomland hardwood forest. The soils at this site are representative of wetlands, and indeed, the grounds are wet throughout the rainy season. This site possesses tall grass prairie, upland forest, bottomland hardwood, and a bottomland hardwood restoration area planted in 2005. This 37 acre preserve has four trail heads: the first is accessed from of a well-marked parking area located off of Chautauqua Road, the second is located at the western terminus of Freeman Street, the third is located just west of the Flagland site off of Sunset Road (along the east edge of the Carbondale Park District Soccer Fields), and the fourth is at the south end of this trail where it meets Chautauqua Road. The intensity level of each of the trails is light, unless one wishes to cross Little Crab Orchard Creek to successfully loop the trail system. The creek crossing is very steep and should only be attempted when the creek level is low. The Maurice Webb Trail (named after former Green Earth Board Member and President, M. Webb) meanders through a tall grass prairie, a riparian woodland, and the reforestation area, looping back to the trail head and parking area off of Chautauqua Road. The trail is approximately 1.3 miles in length and forks to intersect with the Woodland Spur Trail to the north. The Woodland Spur can be accessed from the Freeman Street trail head and trends northwest through an upland woodland. The trail passes a seasonal pond that is inundated throughout the rainy season. 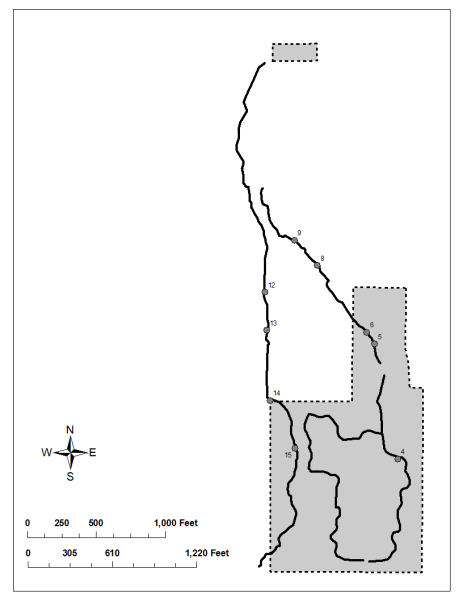 The .75 mi trail can either end at Little Crab Orchard Creek and be retraced back to the Freeman Street trail head, or continue on to cross Little Crab Orchard Creek to connect to the David Kenney Trail. The creek crossing is very step and should be only be considered by those willing to get their feet wet. The David Kenney Trail (named for former Green Earth Board Member, former Green Earth President, and former Director of the Illinois Department of Conservation, D. Kenney) travels along the west bank of Little Crab Orchard Creek from Chautauqua Road to Sunset Road. The trail is approximately 1.0 mile in length and provides beautiful views of the creek and its cliff banks.